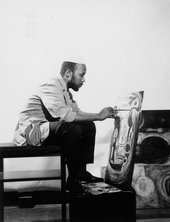 One of the most significant figures in African and Arab Modernism, Ibrahim El-Salahi’s ground-breaking work established a new visual vocabulary in Sudan, which arose from his own pioneering integration of Islamic, African, Arab and Western artistic traditions. His unique style transcends geographic and cultural boundaries and has inspired artists in Sudan and elsewhere in Africa for generations. El-Salahi's art offers profound possibilities for understanding African and Arab modernisms and repositioning them within the context of a broader, global modernity. In the context of the opening week of his major retrospective at Tate Modern, bringing together 100 works from across more than five decades of his international career, El-Salahi is joined in conversation by Salah M Hassan, director of the Institute for Comparative Modernities and professor of African and African Diaspora art history and visual culture at Cornell University. This conversation will be moderated by Elvira Dyangani Ose, Curator of International Art, Supported by Guaranty Trust Bank at Tate Modern. was born in Omdurman, Sudan in 1930 and now lives and works in Oxford, England. His work has been shown at such venues as PS1, New York; Mathaf: Arab Museum of Modern Art, Doha; and Haus der Kunst, Munich. He is represented in numerous private and public collections including the MoMA, New York; New National Gallery, Berlin; and Tate, London. He received the Rockefeller Foundation Fellowship; the Order of Knowledge, Arts and Letters, Sudan; and the Honorary Award, Prince Claus Fund for Culture and Development. is the Goldwin Smith Professor and director of the Institute for Comparative Modernities, and professor of African and African Diaspora Art History and Visual Culture in the Africana Studies and Research Center, and in the Department of History of Art and Visual Studies, Cornell University. He is editor of Nka: Journal of Contemporary African Art, and consulting editor for Journal of Curatorial Studies and Atlantica. He authored, edited and co-edited several books including Diaspora, Memory, Place 2008, Unpacking Europe 2001, and Authentic/Ex-Centric 2001, and curated several international exhibitions including Authentic/Ex-Centric (49th Venice Biennale, 2001), Unpacking Europe (Rotterdam, 2001-02), and 3x3: Three Artists/Three Projects, David Hammons, Maria Magdalena Campos-Pons, Pamela Z (Dak'Art, 2004). Ibrahim El-Salahi: A Visionary Modernist is curated by Salah M. Hassan, Goldwin Smith Professor,Cornell University. The presentation at Tate Modern is curated in collaboration with Elvira Dyangani Ose, Curator, International Art, Supported by Guaranty Trust Bank Plc.